The standard model FN Minimi firing NATO standard 5.56x45mm ammunition. The weapon shown here is fitted with a 200-round plastic magazine. In action, the carrying-handle would be twisted down beside the body out of the way of the fire. WHEN THE 5.56MM M 16 (Armalite) rifle entered service during the Vietnam War it gave every man in the squad an automatic weapon, but with a maximum effective range of little more than 330yd (300m). It was quickly realized, however, that both fire teams needed a weapon of greater all-round capability, but lighter than the contemporary 7.62mm M60 and one which used the same ammunition as the riflemen. This gave rise to a US Army requirement for a 5.56mm Squad Automatic Weapon (SAW), with the US Marine Corps joining the program later. 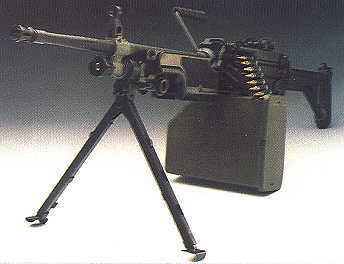 After considering all suitable weapons in the Western world, the US forces selected a "product improved" development of the Belgian Fabrique Nationale's (FN) "Minimi" which was placed in production as the M249, with initial supplies coming from the FN factory in Herstal, although a US line was subsequently established. The product improvements in the US version include minor changes to the barrel, buffer, handguard, pistol grip, stock and sights. Length overall - 40.87in (1,038mm); barrel - 18.4in (466mni). Gun empty, with bipod and toots - 15.161b (6.88kg); 30-round magazine: 1.071b (0.49kg); 200-round box magazine: 6.92tb (3.14kg). 30-round box, or 100- or 200-round belts; gas-operated, disintegrating link belt. Effective range against area target - 1,093yd (1,000m); maximum range: 2.23 miles (3.6km). SS109 - 3,000ft/s (915m/s); M193 3,166ft/s (965m/s). Cyclic 725rpm; sustained - 850rpm. The Minimi showing its various ammunition feed systems. 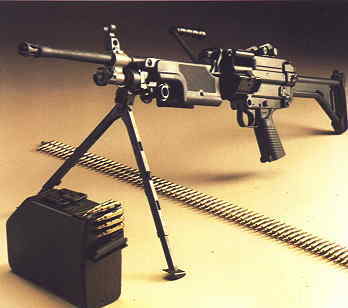 In the front is a traditional pattern 30-round box, while between the bipod legs is a pre-loaded 200-round plastic box magazine. Aligned underneath the weapon is a belt, which is issued in either 100- or 200-round lengths. The weapon accepts either magazines or belts without any modification.